The pick we are using is the newest 3in1 version of the tool. 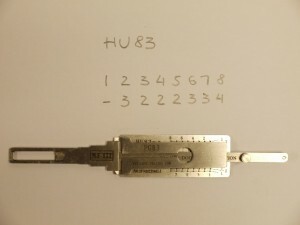 The HU83 lock is widely fitted across the Peugeot Citroen range; the tool picks and decodes all in the range despite their being 2 different series. You will see that the lock has 8 positions; even on one side and odd on the other, as the lock follows a 1 up, 1 down pattern. There are 4 key heights for the decode and we decode in the same direction as we pick. If you have the older single lifter tool it’s still possible to pick the lock in the same way, but when decoding it will be in the opposite direction to the pick. The HU83 lock only has 7 positions which will always be ‘felt’ picked and decoded in positions 2 to 8 – when entering into the key machine we enter as positions 1 to 7. The answer is simple; the tool also picks and decodes the Mini and the Rover 75 lock, which both have 8 positions, hence why the tool needs 8 positions. We begin by centring our lifting arms and fully inserting the tool into the lock so that a wafer is felt in position 2, and position 8 – this confirms full entry. In UK models, we apply a medium tension on the tension arm in the clockwise direction to open the lock. With tension applied we gently tickle each wafer position to find a binding wafer – if the wafer moves at all, even a small amount leave it alone – we only pick solid binding wafers. Position 5 is 1st to bind and pick. Position 2 is next to bind and pick. Position 7 is next to bind and pick. Position 4 is next to bind and pick. Position 6 is next to bind and pick. Position 3 is next to bind and pick. Once position 3 is picked the lock opens. Holding the lock in the open position we are now ready to decode it; it is worth noting that we did not need to pick position 8 – this confirms position 8 is a number 4 cut. As we are using the twin lift tool we must decode in the same direction as we picked each wafer in. So holding the lock in the open position we run the decode from position 2 to 8 on the tool in turn. Position 2 decodes as a number 3 cut. Position 3 decodes as a number 2 cut. Position 4 decodes as a number 2 cut. Position 5 decodes as a number 2 cut. Position 6 decodes as a number 3 cut. Position 7 decodes as a number 3 cut. Position 8 decodes as a number 4 cut. The tool reads the key as: 3222334. Position 8 decodes as a number 4 cut. The tool reads the key as: 3222334. We would then enter our cuts into the cut to code machine of 3222334 in positions 1 to 7 and cut the perfect key. 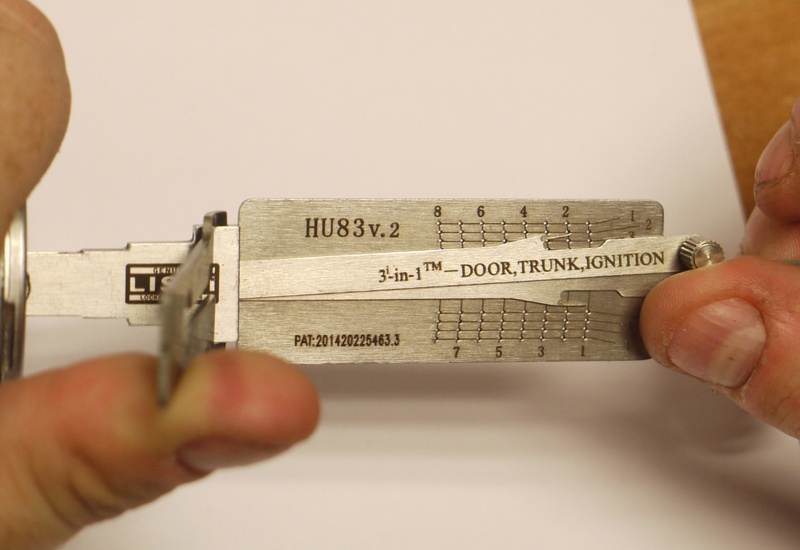 To find out how to pick and decode the HU83 lock, check out edition 6 of CKL!